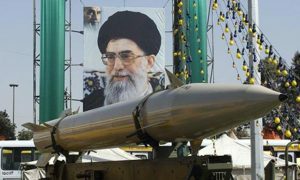 WASHINGTON — Iran, which could be furiously working on developing nuclear weapons capabilities, said it needed an extension of the current negotiations surrounding nuclear weapons. Reuters reported that the country has requested an extension of current nuclear arms talks beyond the July 20th deadline. Yet, many are skeptical that these talks will pan out. Some say that the talks will be on hiatus until September at the earliest, but it does not allay the fears of other neighboring countries in the Middle East or the West. Iran says that it is enriching uranium, a key component of eventually developing nuclear arms, for peaceful purposes. Other countries doubt the peaceful nature of their intentions. The effort has been spearheaded by U.S. Secretary of State John Kerry, but has not yielded any concrete results. Accuracy in MediaBarack ObamaIranIslamJohn Kerrynuclear weaponsU.S.